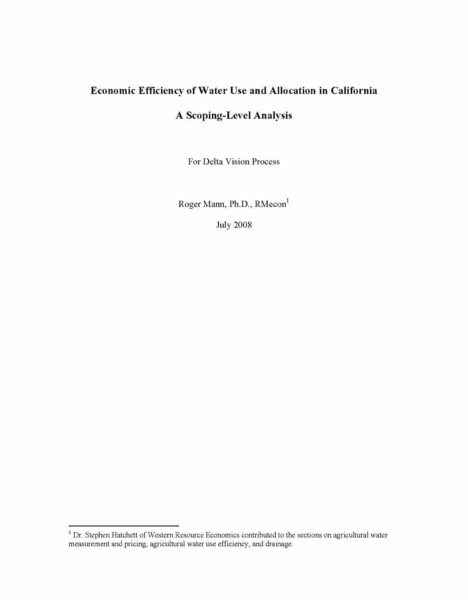 The purpose of this paper is to provide a basic understanding of water transfers in California with an emphasis on transfers that move water through the Sacramento-San Joaquin Delta (Delta). This paper provides an overview of various types of water transfers, their recent history, and the regulatory setting that governs transfers. 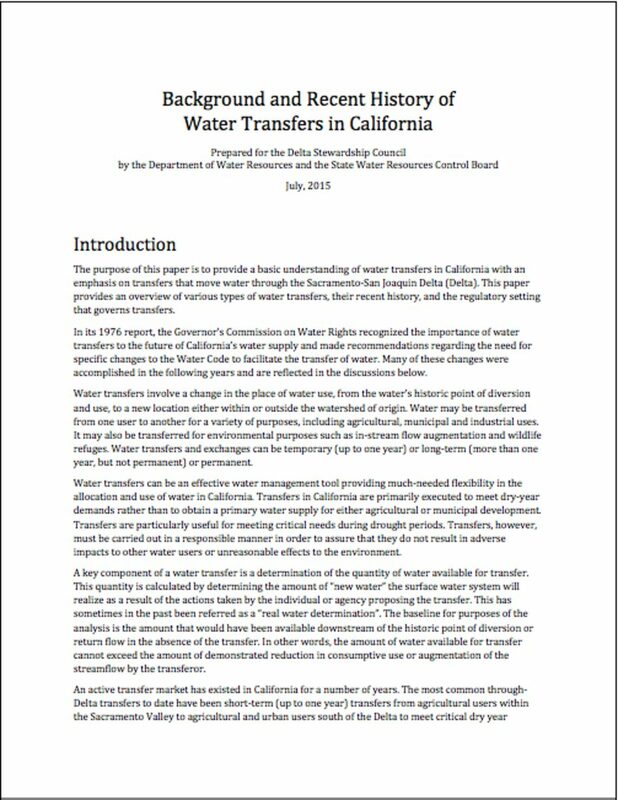 In its 1976 report, the Governor’s Commission on Water Rights recognized the importance of water transfers to the future of California’s water supply and made recommendations regarding the need for specific changes to the Water Code to facilitate the transfer of water. Many of these changes were accomplished in the following years and are reflected in the discussions below. Water transfers involve a change in the place of water use, from the water’s historic point of diversion and use, to a new location either within or outside the watershed of origin. Water may be transferred from one user to another for a variety of purposes, including agricultural, municipal and industrial uses. It may also be transferred for environmental purposes such as in-stream flow augmentation and wildlife refuges. Water transfers and exchanges can be temporary (up to one year) or long-term (more than one year, but not permanent) or permanent. Water transfers can be an effective water management tool providing much-needed flexibility in the allocation and use of water in California. Transfers in California are primarily executed to meet dry-year demands rather than to obtain a primary water supply for either agricultural or municipal development. Transfers are particularly useful for meeting critical needs during drought periods. Transfers, however, must be carried out in a responsible manner in order to assure that they do not result in adverse impacts to other water users or unreasonable effects to the environment. 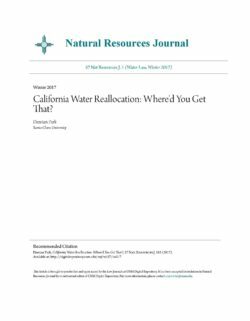 California Water Reallocation: Where’d You Get That? When thirsty, Californians often avoid going to the market for more water. Instead, they might borrow some from their rich neighbors, they might sue them or more commonly, they simply take more from users without much of a voice (e.g. the fish or future generations). These alternatives are often superior to using markets. Within markets, a surprising detail emerges – it is uncommon for farmers to fallow fields in order to sell water to another user. Rather, many water transfers are structured so sellers can have their cake and eat it too. While some of these transfers rightly bring about jealousy and criticism, they likely do facilitate efficient water use. In discussing these points, I provide a more holistic description of how water users reallocate water as well as a richer understanding of how California’s water market actually works. 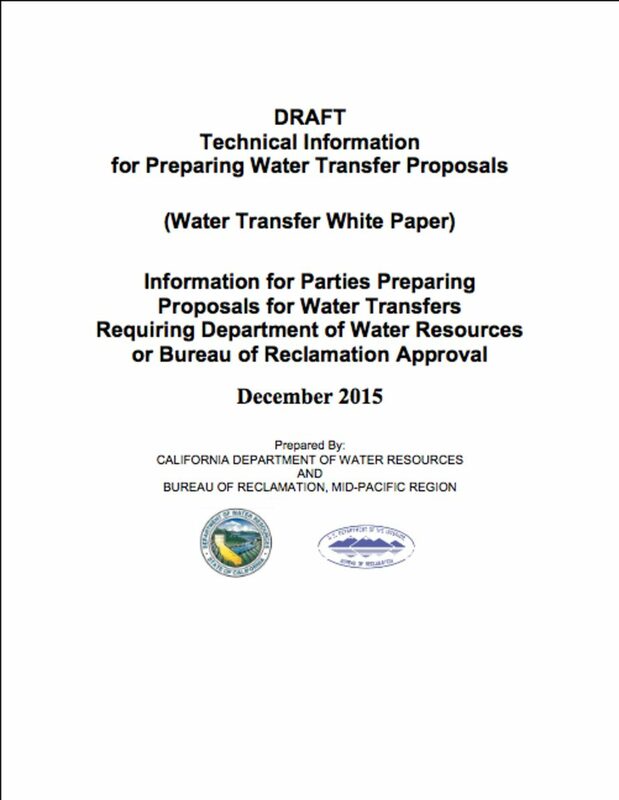 The California Department of Water Resources (DWR) and Bureau of Reclamation, Mid-Pacific Region (Reclamation), referred to collectively as Project Agencies, prepared this technical information to help facilitate temporary water transfers (duration of up to 1 year) that require conveyance through Project Agencies’ facilities or otherwise require Project Agency approval. 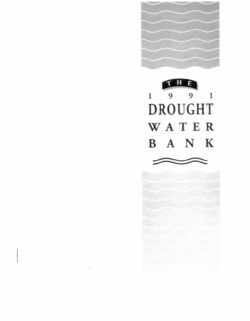 This report, produced by the Department of Water Resources, provides a retrospective of the operations of the 1991 Drought Water Bank. 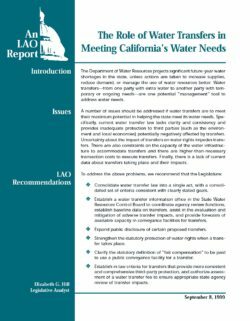 If water transfers are to help the state meet its water needs, we think that the Legislature should address a number of issues, including impediments to transfers and stakeholder concerns about potential negative impacts of transfers on "third parties." Statutory policy on water transfers should be clarified and made more consistent. The California Water Code (CWC) defines a water transfer as a temporary or long-term change in the point of diversion, place of use, or purpose of use due to a transfer, sale, lease, or exchange of water or water rights. Temporary water transfers have a duration of one year or less (CWC Section 1725). Long-term water transfers have a duration of more than one year (CWC Section 1728). Transfers can be between water districts that are neighboring or across the state, provided there is a means to convey or store the water. A water transfer can be a temporary or permanent sale of water or a water right by the water right holder, a lease of the right to use water from the water right holder, or a sale or lease of a contractual right to water supply. Water transfers can also take the form of long-term contracts for the purpose of improving long-term supply reliability. 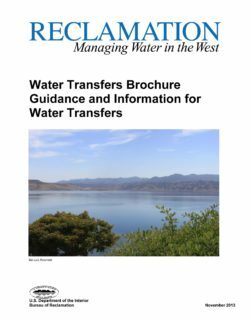 The Bureau of Reclamation (Reclamation) developed the Water Transfers Brochure (Brochure) to assist water purveyors in the preparation of water transfer and Warren Act proposals and documents. It is a “work in progress” that will be refined as necessary to adapt to changing circumstances or improve its utility, this Brochure provides general guidance on communicating, preparing, and submitting a proposal, as well as presenting estimated timelines for associated requirements, actions, and approvals. 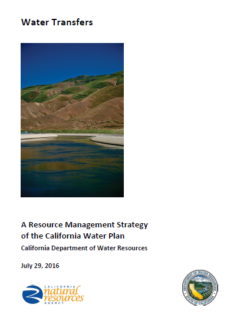 This Brochure is meant to increase the efficiency of the logistical and administrative processes that Reclamation and the transfer parties control and to further the goal of timely facilitation of water transfers that require conveyance through Central Valley Project (CVP) facilities or otherwise require Reclamation approval. This Brochure provides a framework and certain details of the processes; however, dependent on the transfer or Warren Act proposal, additional coordination or steps may be necessary to facilitate approval of a proposed action. Reclamation encourages all water purveyors to work closely with their designated Reclamation representative in developing transfer, exchange, and/or Warren Act proposals.